WELCOME TO THE BOAT-BOARD “SAFE AND EASY” PAGE!!! This page is dedicated to explaining the Boat-Board.com SAFE AND EASY BOARDING METHOD and its ADVANTAGES. 1. Right hand grabs the handle and right foot step up on boat-board. 2. Left foot step up on bow and you’re on board! 1. Left hand grabs the handle and left foot step down to boat-board. 2. Right foot step down to trailer tongue and you’re done! · ALWAYS FACE THE DIRECTION TRAVELING (don’t step backwards)! · ALWAYS START THE 2-STEP PROCESS WITH YOUR FOOT THAT IS CLOSEST TO THE HANDLE (right foot first going up & left foot first going down)! · No more crawling, sliding, or jumping into or out of the boat. · Anti-skid surface on the Boat-Board step provides sure footing and fast boarding. · Boat-board handle provides unparalleled confidence when boarding and exiting boat either day or night. 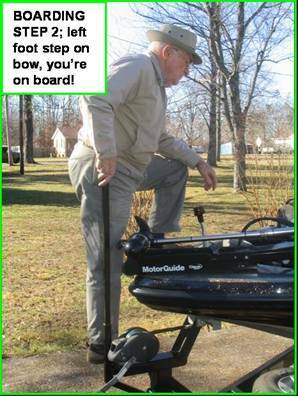 · Less risk of injury caused by slipping or falling when boarding or exiting the boat bow. · Less risk of falling into the water when launching or loading boat, getting wet when you don’t want to, or even possibly being knocked unconscious and drowning. 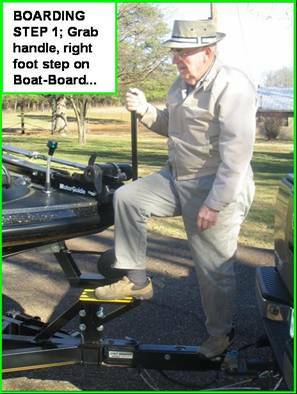 · No more trolling motor damage using it for a substitute handle. THANKS FOR VISITING THE BOAT-BOARD.COM WEBSITE!! CHECK BACK SOON FOR THE LATEST UPDATES!! Please bookmark this site to your favorites & check back later.